Your precious Cocker Spaniel puppies have gotten older and grown up. Now what? Do you know what to expect in these adolescent/teen years? Even though we have puppies at Furry Babies, we are still very educated in this arena! 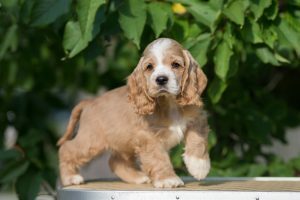 Keep reading to learn what to expect as the Cocker Spaniel puppies for sale that you purchased starts to age. As they get older, they’ll start to slow down a little bit, and we really mean a little bit. At times they’ll seem interested in training and other times they won’t. You must keep it up, however, because you don’t want them to lose any skills they’ve learned. Practice in different environments and reward them with treats. As we mentioned, they’ll slow down a bit but continue to play with your Cocker Spaniel puppies. Playing helps with dog training and building a relationship with your pets. Don’t ever stop. Adolescent dogs have energy still so they will always need to burn it off somehow. Wouldn’t you rather it be outside than ripping up carpet inside? Don’t let exercising slack off during these teen years. No matter the age of your Cocker Spaniel puppies, they should always be consuming a healthy diet that’s low in fat and sugars. The treats should be healthy too, in fact, there are some human foods that are great for dogs. Our point is that you want to make sure that they are still maintaining a good diet. Overall, be prepared for some ups and downs as those Cocker Spaniel puppies for sale you’ve got begin to age. The teething is gone and the energy is down, but there’s still lots of love to go around!